I picked this book from a NetGalley email, mostly because I liked the sound of the title and because the cover caught my attention. I know “Never judge a book by its cover” and all that, but seriously, I can’t be the only one that does that, right? And actually, that leads me into one of the major themes of this book: don’t judge everyone based on what you see. In fact, I just spotted this blog post by Sara Barnard, the author, on the cover: Please judge my book by this cover. I’ve taken today as holiday (thanks to a punctured car tyre with two screws and a thorn in it, awaiting delivery of a new one now) so decided to finish this book. Then I had to write this review immediately. Yes, it is one of those books. 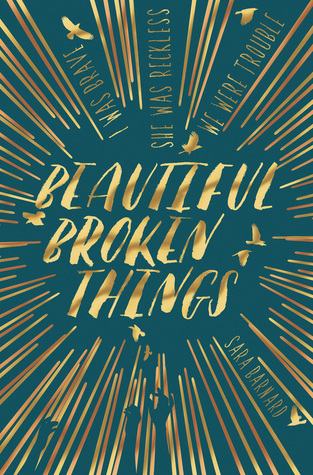 I saw rave reviews of Beautiful Broken Things on Goodreads and crossed my fingers that I would love it as much too. Sometimes books with almost full 5 star reviews turn out to be my favourites and sometimes I strongly dislike them. Fortunately this was a love, and possibly one of my favourite books to date – not only was it a story to love, but its message also made a big impact on me. It’s one I made notes on while reading, and for the first time I used the “highlight” feature in my Kindle to select passages I could come back to and quote in this review. The tagline for the book is: “I was brave. She was reckless. We were trouble.” And to be honest, this was one thing that very nearly turned me away from reading the book. I knew the storyline was that of a friendship between teenage girls and this tagline gave me the image of the kind of girls I never was or wanted to be friends with, as in, the ones who you’re a little bit scared of when you see a group in town. Luckily I did pick up the book and start reading as that image wasn’t at all what the book claimed to be at all. I was also worried that it would be another of those lighthearted kind of YA books – two teenage girls who are best friends, a new girl arrives, joins their group, she’s trouble, lots of arguments ensue. But again, I was wrong on that one as the book is so much deeper, exploring the intricacies of teenage female relationships beyond the surface of what you usually see in addition to the topics of mental health and abuse. You’ve got a kind of overarching description of the plot in the paragraph above, but for a little more detail: meet Caddy – she’s a normal teenage girl, getting by in school, has a small group of friends and a best friend, Rosie, who attends another school, but nothing significant has happened in her life, nothing to rock the boat and give her stories to tell. Then a new girl, Suzanne, starts at Rosie’s school. At first Caddy is nervous that she will be replaced by her, a confident and beautiful girl, but slowly, after a couple of false starts and bouts of honesty, a new version of friendship begins to form between the 3 girls. But like I said before, Suzanne is not all she seems on the surface; she carries dark secrets and a difficult past, things that slowly drag dependable Caddy down with her. Also it’s worth noting from the above paragraph the small messages hidden within the story – a couple of things to look out for, Suzanne’s necklace and the meaning behind it as a dove, and both Tarin and Suzanne, the two who suffer from mental health issues, and their references to birds in general (and only after writing this did I notice the birds on the cover!). It made me feel strange to think of Suzanne being labelled as having 'serious mental-health problems'. Technically I knew it was correct, but it wasn't her. The four words seemed so scary and huge, painting the image I had of my friend in colours I didn't recognize or understand. 'That's not very helpful, Tarin,' Mum said drily. The fact that we so rarely hear anything about the actual abuse that has happened in the book is telling of this; what we’re seeing are the after effects, how it affects not only the person themself, but those around them. And the fact that the violent side of the abuse isn’t all, in fact, it is implied that the violent side of it is only a minor part, it’s the emotions behind the violence of guilt, blame and responsibility on someone who was only a child when it began. Add in the fact that it is noted several times that the abuser looks just like an ordinary person, not big, not necessarily scary. It brings to the forefront the idea that this could and does happen to anyone. Then there’s the subject of fronts, faces and everything not being as it seems, Caddy coming to understand that confident and self-assured Suzanne isn’t what she thought, and Suzanne trying to get to know herself without the influence of others that hurt her. Why did I assume so much about people and their lives? Why did I think that if it didn't happen in front of me it didn't happen at all? It was just a couple of lucky phone calls, and a girl who knew her friend. I both understood and didn't understand what she was saying. What I did know was that I was the wrong person to hear it. It’s the story of Caddy who is, as described in by both Suzanne and her sister as “the nice one” coming to realise that world isn’t always so simple, that significant life events do change you as a person and shape who you are, but are so much more complicated than they seem, and that not everything can be solved quite so easily. It’s a mix of happy normal teenagers and sad and complicated ones, then ones that are a bit of both, all combinations of which are relatable. Sara’s blog post in June discusses whether YA is too dark, and this review might appear to make it so, but whether or not people are writing about these topics, these things are still happening to teenagers out there, and maybe books like this will help those that need it. So let me sum it up for you. If you buy any book next year, buy this one. Seriously. Do it.